James Stewart and Doris Day, in a rare dramatic role, are superb in this brilliant suspense thriller from the undisputed master. Stewart and Day play Ben and Jo MacKenna, innocent Americans vacationing in Morocco with their son, Hank. After a French spy dies in Ben's arms in the Marrakech market, the couple discovers their son has been kidnapped and taken to England. Not knowing who they can trust, the McKennas are caught up in a nightmare of international espionage, assassinations and terror. Soon, all of their lives hang in the balance as they draw closer to the truth and a chilling climactic moment in London's famous Royal Albert Hall. I don't know, but this movie was rather boring (*waiting for Jon to put me right* ). I like James Stewart, but I feel his acting range is not very wide. He always seems to be playing the same character. 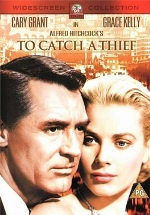 You'll find in any unbiased appreciation of Hitchcock's career that this and To Catch A Thief get a kind of "meh" response. But look at his rate of output. I always had the impression that he did one for the money while concentrating on the next. This was the first time I had seen this one, though I had heard of it before. The plot works well even though it isn't as complex as some of Hitchcock's other movies. It is just dealing with the survivors in the lifeboat, but since one of them is German, that does add some issues that get dealt with. There is a bit of mystery tied to if Willy is really trying to help or if he has something else in mind like at least one of the others believes. There are a few confrontations that help to keep things interesting. One rather drastic thing is done at one point, though nothing much is shown, it is still clear what is going on. A few somewhat disturbing things happen, though they all make sense given what is going on in the movie. There isn't as much shared about most of the characters. Constance seems the most developed even though still many things remain a mystery about her. Overall, I really enjoyed the movie. I even managed to review of it posted on Epinions. I remembered To Catch a Thief as as underwhelming, but watching it again I found it to be far more enjoyable. It's light and unassuming, with little to mark it out technically, but very well played and quite fun. The romance is more obvious than usual and is fundamentally in place earlier than Hitchcock's usual man-wrongfully-accused-on-the-run-falls-in-love setup. The man in question this time is the brilliant Cary Grant, one of Hitch's most dependable leading men. Here he has a chance to show off his cat-like grace properly as a cat-burglar. He was the best actor to never play Bond and once again, I have to wonder how much influence Hitchcock had on the choices made in the early years of that franchise. Certainly the plot could easily be suited to an average Bond entry, complete with infiltrating high society using a false name and a scene set in a casino (very funny too, in Hitchcock's typically cheeky style!). Grace Kelly complements Grant and does enough as a slightly spoilt rich kid, but adds a little sassiness that only she could pull off. The scene where she is convinced of Grant's guilt is brilliantly staged. That follows the famous fireworks moment and it is one of the films highlights. While the fireworks themselves are a bit limp, it's the staging in the room, both lighting and acting, that really impress. The climax also impresses with Grant hiding in the shadows of a rooftop, but overall there's nothing flashy, just beautiful landscapes to wonder at. The last time I saw it, I rather dismissed it as a holiday brochure, but it has far more substance than that. Not enough to be amongst the Master's best, but a very enjoyable way to pass a couple of hours. technically this is even a "whodunnit", something Hitchcock normally despised (at least didn't care about) and avoided to do. He could have improved it a bit by fleshing out some of the other suspects a little better. I will watch it tomorrow. Hollywood icons 'James Stewart' and 'Doris Day' are Ben and Jo MacKenna, an innocent American couple vacationing in Morocco with their young son. But their simple plans turn into a nightmare after a French spy dies in Ben's arms in a Marrakesh market, and their son is kidnapped and taken to another country. The classic "Que Sera, Sera," from the film's chilling climax in London's Royal Albert Hall, won the Academy Award® for Best Song. See Doris Day in a rare dramatic role and James Stewart as 'The Man Who Knew Too Much' in this thrilling tale of international espionage, assassinations and terror. The actual climax of the film in the Albert Hall (which is not where Que Sera, Sera is sung, the cover blurb got that wrong) is awesome and exciting. Doris Day's acting here is wonderful, showing us a mother torn by her emotions. The editing is also excellent and the use of the music drowning out the dialog works great. Unfortunately there is a second climax which could have had the film going out woth a little bang at least, but somehow they manage to have everything grind to a halt and suddenly it's over. Jon already mentioned in response to Tom that apparently this was a contractual job by Hitchcock and unfortunately that notion comes through almost all the way. A dedicated psychiatrist (Ingrid Bergman) falls for a man (Gregory Peck) who may or may not be a cold-blooded murderer. I enjoyed this movie overall. Some scenes do move slower and there it almost seems at times if the psycho babble stuff is tossed in more often to make the movie longer, but I still think it is entertaining overall. The characters are interesting for the most part and I was interested in finding out the truth about Peck's character. I did think that the relationship between Constance and Dr. Edwards progressed faster than was believable, but I still enjoyed the movie. The dream sequence is interesting and a bit..bizarre...which works. I do wonder what the sequence would have been like if Selznick hadn't cut much of it. The extras on my version of the DVD are interesting. There is one about Dali and the dream sequence and it also covers the fact that Selznick cut a lot of the scene. 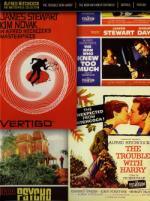 A few little memos from Selznick are shown. Another one talks about psychoanalysis and how it was used in the movie. There is also one about an actress. I can't remember her name at the moment, but she talks about being discovered. The extras were interesting. Overall I really enjoyed this movie. As I am not the only one behind in this marathon and I am not sure, if I get to watch "The Wrong Man" this weekend, I will wait with announcing the next deadline, until Jon has watched "The Man Who Knew Too Much" and "The Wrong Man". Provided of course that noone minds. I'm still working to catch up..though I'm no longer sure how far behind I am. About three months. You can see it in the first post which I have updated yesterday. 3 months? Wow...I didn't realize it was that bad. Well...I will finish..eventually. Just like I will eventually finish the Bond movies.